Due to the financial crisis around the world, stability of the banking sector is critical. 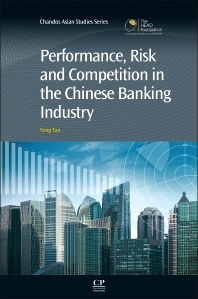 Several rounds of banking reforms in China have aimed to improve performance and competition, and <I>Performance, Risk and Competition in the Chinese Banking Industry</I> provides a comprehensive analysis of performance, risk, competition and their relationships in Chinese banking industry. The book consists of seven chapters: the first chapter gives an introduction, followed by an overview of the Chinese banking sector in chapter two. Chapter three discusses corporate governance in the Chinese banking sector. The fourth and fifth chapters investigate risk, performance, competition, and their relationships. Chapter six outlines future development of the Chinese banking sector, and finally, chapter seven provides a conclusion. Yong Tan is a senior lecturer in the Department of Strategy, Marketing and Economics at the University of Huddersfield Business School, UK. His research interests are in the area of banking performance, banking competition, as well as stability in the banking sector. He has authored and coauthored research articles in various high quality academic journals. His book Performance, Risk and Competition in the Chinese Banking Industry was published by Elsevier in 2014. He has presented his research at international academic conferences held in Ireland and Australia.